Grand Prize Winner of Harlequin's 2015 So You Think You Can Write contestDebut author Lauren D.M. 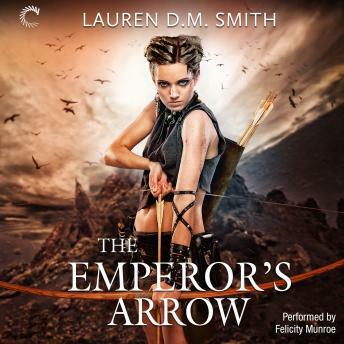 Smith delivers an epic fantasy romance in this soaring tale of a kickass warrior and the emperor she's honor-bound to defendThe bride candidates have been summoned. Their numbers are many, yet only one is an Amazzi warrior. Only one would give her life to protect him.Evony of Aureline, warrior of her people, has no intention of becoming a hideous old man's bride. Though her people have sworn their loyalty to the legendary emperor Galen, Evony knows little of courts and intrigue. It's simply not her world.Yet it's on the palace training grounds where Evony's archery skills gain her the respect of soldiers and legates alike. The emperor himself takes notice of the beautiful, ruthless warrior. In turn, the young, steely eyed Galen is nothing at all what Evony expected.This man could very well conquer her heart. But does he feel the same?As the rivalry among the remaining bride candidates intensifies and the plot for the throne unfolds, Evony must make a grave choice: fulfill her destiny and protect her people or follow her heart and pursue true love.Either way, the honor of the Amazzi people and the future of the empire now rests with Evony of Aureline. For she is the Emperor's Arrow.